Over all size 20″ (W) x 21″ (D) x 9″ (H), App. weight 4 lbs. Power ratings: 115V/60Hz, 1.5 Amp. 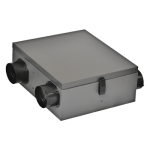 HRV is available with washable Aluminum (RHRV-C100A) or Polypropylene (RHRV-C100P) core. ERV is available with Enthalpy core (RERV-C100), drain less design. High efficiency energy saving, permanently lubricated with variable speed PSC motors for air balancing. Furnace / Fan-coil / Heat Pump Interlock. Dual protection: If the exhaust fan fails, the outside fresh-air supply will be closed by shutting off the supply motor, and the (motorized) damper interlocking relay contact will be opened. Fan-coil / Furnace low speed will be stopped, and at normal operation no cold air will be drawn into the system. Continuous fresh air supply up to 95 CFM. Ideal for horizontal and vertical installation. 4 mounting brackets and 2 drain plugs are included. Exhaust up to two washrooms.